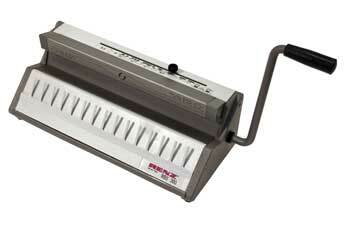 The Renz DTP 340 M is a desktop high performance punching machine. The Renz DTP-240M is capable of punching for wire 3:1 & 2:1 (square or round holes), Calendar, plastic comb, coil and 2 & 4 hole ringbinder. Completely versatile Modular system by adding the closing unit to the front of the machine to match your punching choice. Modules available for wire, comb and coil. This compact machine take very little space due to its modular make up. Modules can be quickly interchanged, the die change takes less than 1 minute. Punching speeds up to 20.000 sheets per hour. Perfect for fast effective production of any manual, books, documents whether wire, comb or coil bound. Whether upgrading from a manual punch machine and looking to speed up production or simply have a requirement for a fast electric punch for your binding needs the Renz DTP-30M is a great buy. Heavy duty high performance electric punch. Punches up to 35 sheets. Fast punch cycle, punches up to 20,000 sheets per hour (80gsm). Change punch dies in less than 1 minute without tools. Calendar die with thumb-cut available. Modular machine. Modules available for Wire binding, Calendar binding, Plastic comb binding and Spiral binding. 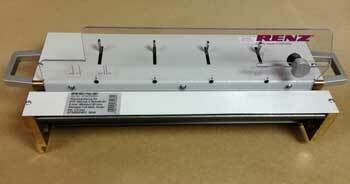 Wire dies available for wire binding with round hole and square holes. Wire closer module with wire holder. Spiral inserting and crimping module. For use if modules are to be used separately as stand alone units. Dies are easy to change in less 1 minute. Available for all loose-leaf binding including calendar die. Wire binding dies available either square or round holes. Price dependent on dies and other modules.